© 2011 by Alyssa Davis; All rights reserved; content may not be copied, rewritten, or republished without authors written permission. Pink is a classic choice for girls of all ages, and there are many shades and variations of the color pink that help you create a fabulous look. 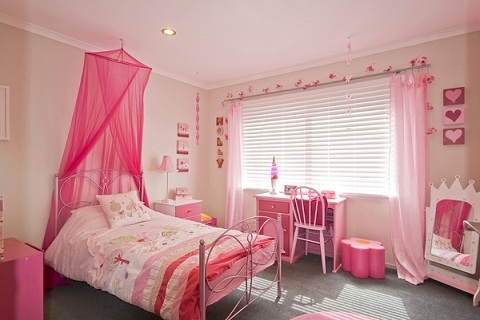 Designing the perfect pink bedroom is a creative use of space for a girl, whether she is a baby or teenager and somewhere in between. The kicker is often finding the perfect complements for the shade of pink that you choose, and coordinating the room around pink can be a challenge if you are stuck in a traditional mentality. Classic white is not outdated, but it often needs some help. Pink and white are simple, basic colors that are great options if you plan to use a pattern or print for bedding and accessories. This is a great choice for a baby girls room, but it will need some help and accessorizing as your little girl begins to grow and personal tastes begin to develop. Classic white goes very well with almost any shade of pink, from the pastels to a deep vibrant fuchsia, and also matches with black accents and accessories. Patterns and prints can transform pink from a solid shade to a perfect complement. A modern geometric print or classic paisley are great choices for the average shade of pink, and they do not have to match perfectly in order to coordinate. Stay away from the old-school methodology of only choosing a solid that is perfectly matched within the print or pattern. Modern, contemporary looks show patterns, prints and solids that coordinate without matching perfectly. What is important is that undertones are the same  all warm or all cool. Chocolate brown is a great choice if you want a touch of contrast for the pink. Used as an accent color, a deep, rich chocolate brown complements any shade of pink very well, and it is a great choice for any little girl. It can be a great choice for teen girls too, especially when paired with other shades of brown and pink that coordinate or patterns to offer variety and depth in the room. Pink and brown are coordinating colors that are easy to pair with many other shades, from white to greens and some purples that offer more red than blue. Basic black offers a striking contrast to pink. Black and white designs are among the trend-setters in a modern, contemporary bedroom, and pink is a great shade for breaking up the contrast to a small degree. For example, most teen girls would love to have a room decorated in great zebra stripes with a hot pink accent and accessory style. Another great example for teens is a solid black and pastel pink combination, which is very elegant and sophisticated. Dont be afraid to pair pink and blue. Many shades of pink coordinate very well with shades of blue, although the colors are considered opposites. For older girls, choose a light shade of pink to match a deeper shade of blue, or vice versa. These colors coordinate very well, and pair with white, khaki or deep browns, and many different pattern and print styles. Light tan picture frames with colorful family photos work perfectly on dark brown wallpapered walls to draw the eye up and around the room. The key to creating a casual feel is to fill the room with casual pieces that can easily incorporate the dark brown wallpaper. Author, Alyssa Davis, is Metal-Wall-Art.com’s number one design specialist on decorating with cowboy western metal art and wolves metal art.